Today my wife Kim contributes to the Hidden Nuggets Series by discussing what we are learning about life from our boys’ wrestling. We have four great kids, two girls and two boys. Our two boys are aged 11 and 6, and they wrestle – boy do they wrestle. All. The. Time. In their room, in my room, outside, at their sister’s soccer game 2 inches from the sidelines — doesn’t matter, they are wrestling. I don’t know how it usually starts, but I have a feeling that one of them pokes the other and then off they go. Now, our 11 year old – (I’ll call him Bubbers – long story) – is about twice the size of the 6 year old — (I’ll call him Doot – longer story). 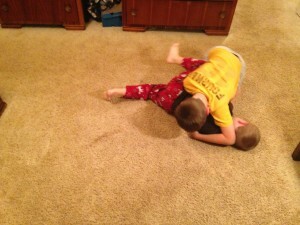 When I watch Bubbers and Doot wrestle, it is really no contest. They are having a ton of fun, but Bubbers wins every single time. It usually takes about 20 seconds or so. Doot will be almost pinned to the ground, usually with an arm raised up in protest, and then boom – Bubbers grabs his wrist and Doot is pinned down flat. Bubbers lets him up, and they’ll start circling around each other to go at it again. Brian and I have started noticing something though about the outcomes. Bubbers still always wins, but it is starting to take a little longer. Doot has figured out that if he gets down a little and lowers his center of gravity, then he can last just a smidgen longer. What do you think will happen when Doot gets to be closer to Bubbers’ size? He is going to dominate these wrestling matches. Why? Because Doot has been wrestling against someone twice his size his whole life. He’s had to figure out different ways to win besides just brute force. So, when the brute force does finally kick in, he’s going to crush Bubbers (and he’s probably going to enjoy that immensely). Doot is being constantly challenged in these wrestling matches. They are making him better. Meanwhile, Bubbers is always winning, so there is no need for him to work to get better. It is the challenge that stretches us and makes us better. The Bible verse I started with says, “As iron sharpens iron, so a man sharpens the countenance of his friend.” There’s so much to love about this verse especially the imagery of one piece of iron sharpening another. Maybe that’s what Doot feels when he’s wrestling with his brother – that he’s always going up against a piece of iron. The verse also reminds us that even though it seems rough and painful, this is what one true friend does for another. When I challenge someone else, it shows that I care enough about them to help them get better. In what ways has someone challenged you to get better in your own life? Is there a way that you can sharpen a friend? What if someone is challenging me to get better…do I take offense at their actions, or realize that it is an act of love? Do I resist the sharpening and try to get away from it or appreciate that it is the pain that is actually strengthening me? Do you have any wrestling moves to help Doot out? Any of your older brothers ever beat up on you? Next Post: Goodbye Mortgage and Lender B.O.A. Hello Baby Step 7! Prior Post: A Student Debate: Are There Absolute Truths About Money and Personal Finance? I have two nephews, they are 11 and 10 years old. When they are younger, the older one always wrestled his younger brother. But now, it’s different they are like best friend, the older brother always help his brother. I think you really do learn more about yourself and what works when facing big opponents. Sometimes you need to have the go to methods challenged before its possible for you to understand what you are really capable of! That’s a great point, Leonard — we do learn alot about ourselves when we face big opponents. Knowing how we personally react to adversity is powerful. I can so picture Doot and Bubbers wrestling. I grew up with two younger sisters, so we did our fair sharing of bickering but being girls we were far too posh to wrestle. You know, we pulled hair instead. 🙂 You bring up an excellent point that when we always win, it is very easy to get complacent. But when we fail but keep trying, we continually push and stretch and grow our abilities. Have a great weekend, Kim! As the mom of an 8 year old boy, I definitely understand constant wrestling need. I don’t understand it, but it seems to be a universal appeal to all little boys. Anywho, I think that many of us miss the gift we are given by the struggles we face or the competition. I know people who let it bring them down and put them in a bad place. I love a good challenge because I love the way it helps me grow. The growth period may be uncomfortable, but it really is a gift. Its hard though, sometimes to realize that the challenge is good for us. I think that the temptation would be to gravitate back to our comfort zone to escape. It would be easy for Doot to just quit wrestling, but then he’d never get better. As a musician from a young age I was always surrounded by people at different levels so it always encouraged me to want to be a better musician and singer. It got me into the mindset of never wanting to stay stagnant in whatever I wanted to accomplish. This was a really insightful post and thanks for sharing it. Thanks, Kassandra. You bring up a great example — I bet playing in an orchestra or a band is very challenging in that you always are striving to be better. Do you still play? What instrument? I studied classical clarinet for many years but I switched to being a singer-songwriter a few years ago. When I was first learning beach volleyball, everyone gave me great advice to always play up if I had the opportunity…ie, constantly get my *ss kicked in games. But…that improved my game so much, so when I went back to playing my level I started doing very well. So it works! Actually, now that you say that, it reminded me that when I was in 1st grade, there wasn’t enough kids in the 1st grade to have our own class, so we were in a “cluster” with 2nd grade. So, there I was sitting in a 1st grade class, but I heard 2nd grade stuff — I think that helped me get ahead. I had forgotten all about that — great point! I had a big brother growing up, and I think it helped me understand that I will sometimes have to take on challenges that seem a little tough up front. These days.. If you are not pushing yourself out of your comfort zone, then you are doing it wrong! I’m an only child myself, so it’s kind of fun for me to see how my kids interact. My sister is nine years younger than me, so growing up it was me and the boys. I’m also tiny so I was ALWAYS challenged. I truly think it has made a big difference in my strength not only physically but mentally, as I have to withstand a lot of defeat in my profession. I think the mental aspect is a good point that I didn’t really touch on in the article — I think that maybe the “everybody gets a trophy” mentality that rewards people for just breathing air isn’t doing anyone any favors. Working hard and overcoming issues helps us mentally too. I love that verse about iron sharpening iron! It definitely sounds like Doot is going to dominate in the future. I am guilty of picking on my brother growing up (he’s 2 1/2 years younger) and, in part because my growth was stunted from drugs I had to take for asthma growing up, my brother is now about 6 inches taller than me and has over 100 pounds on me! Let’s just say I don’t pick on him anymore haha. I also think we live in a culture where friends don’t challenge others that much. Usually when someone says the tough things that challenge others to become better, they get offended, defensive, and upset. The truly good friends are the ones that you can count on to say the things that others won’t because they don’t want to rock the boat. You’re right, DC — it’s so easy to just go with the flow and stay in our comfort zone and not rock the boat. A little challenge hurts and it will result hopefully in our growth.